Jameson whiskey has been distilled in Ireland since 1780. It is the most widely distributed Irish whiskey in the world. I'm not a whiskey drinker, but I have heard of Jameson. When a beverage has been around a country for 234 years it's not surprising that it has made it's way into their cooking. Liquor adds depth and a sophisticated flavor to any meal. It doesn't take much, a shot of sherry in a soup. 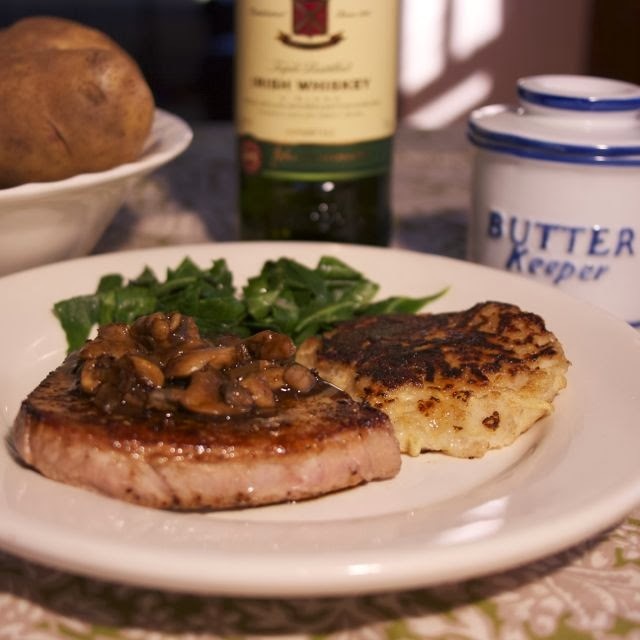 A splash of wine in a sauce... or a shot of whiskey on a steak to make an ordinary dish suddenly have a complex flavor, and unlike butter it doesn't have fat. 1) In a large cast iron skillet sauté the shallots and mushrooms in butter. Remove from skillet, set aside. 2) Saute your steaks and set them aside. Tent them with foil. 3) Turn the heat up to high and add the whiskey. Let it bubble and reduce a little. 4) Add beef broth, salt and pepper. When that gets bubbling lower the heat, and slowly whisk in corn starch. Add 1/2 teaspoon at a time until sauce is the desired thickness. 5) Return vegetables to sauce. Heat through and pour over steaks. 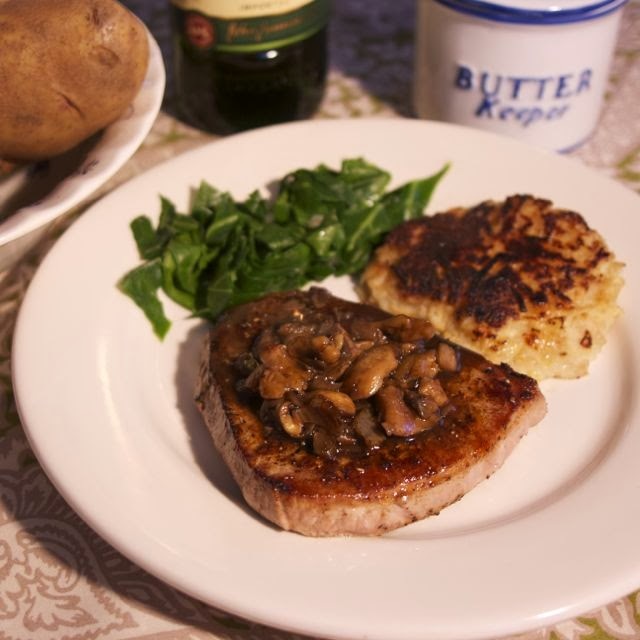 Serve with Boxty Irish Potato Pancakes, or mashed potatoes... and a dark green like spinach or collard greens. Please add your Irish recipes to the linky below and visit my co-host to see what they are cooking in Ireland today. Just click on their pictures! The steak literally tempting me so bad. It's easy to make really... I hope you give it a try. I love my butter keeper, I have had it for years. Fantastic looking steak! 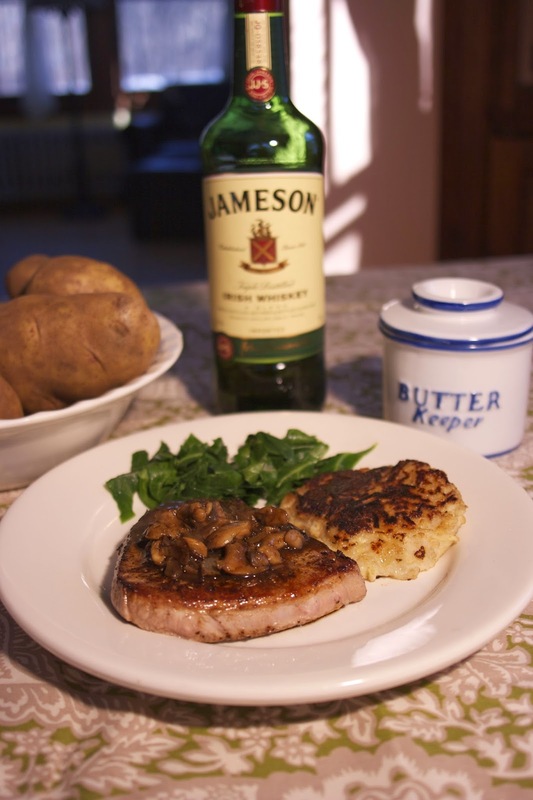 Love the add of whiskey and mushrooms! Nothing quite like steak and whiskey. There are few times I'm tempted to try alcohol, but this is one of them. The description of the flavor you give makes it sound amazing. My kids laugh, I have a cabinet filled with liquor, but I never drink it.. I only cook with it. This looks perfect for St. Paddy’s Day! 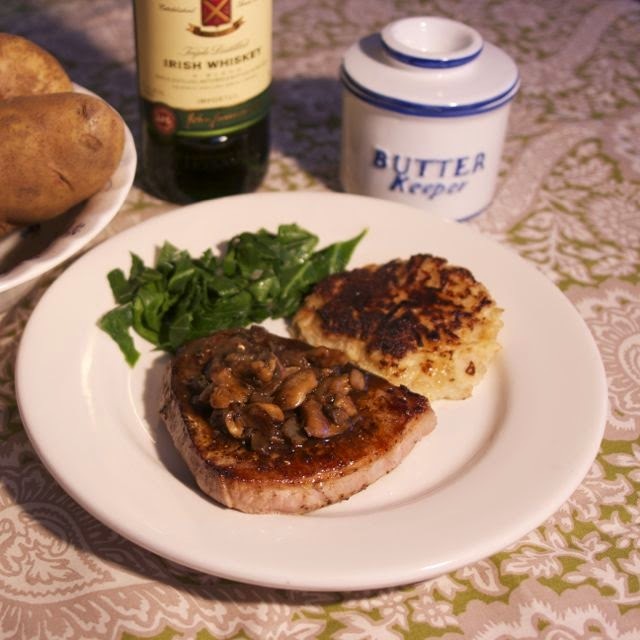 Steak with Irish Whiskey…yum! Your Irish whiskey sauce is going right on the beef tenderloin I'm preparing tomorrow! Jameson's used to have a poetry contest every year. I always entered, never won! Maybe they knew I don't drink any alcohol! I can't image whiskey inspired poetry to be all that good. Maybe yours was too good for their contest. It was a pleasure being part of your crawl. Sounds like a mighty fine way to serve steaks. Thanks for sharing at Simple Supper Tuesday. It sure is... the sauce is amazing. I don't think any man would turn down a whiskey steak. My late Dad used to love Jameson's Whiskey :-) I really like your recipe, Diane. What a flavourful way to serve steak! Even the kids liked this sauce... it is really tasty. Good way to use up the whiskey. This would be fabulous Steak! Hope you are having a great day and thanks so much for sharing your awesome recipe with Full Plate Thursday.